Godori is a card matching game played with the Wonderous Weaponry shopkeeper. It can only be won by those who are patient and plan their moves carefully. 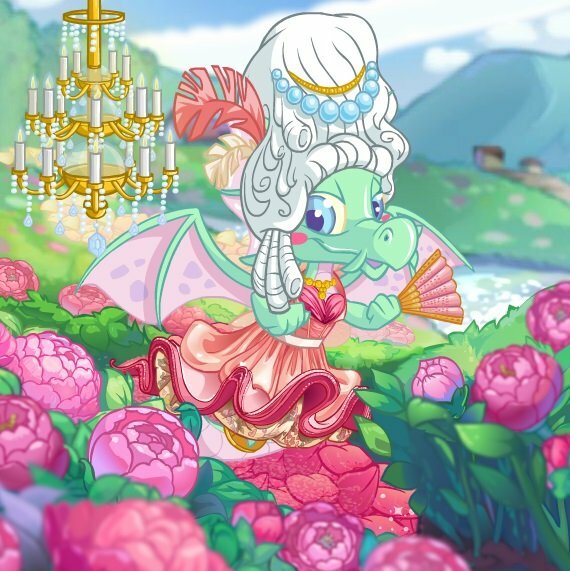 You play Godori against your active pet. Use your mouse to select cards from your deck and to place them on the playing field on the table. 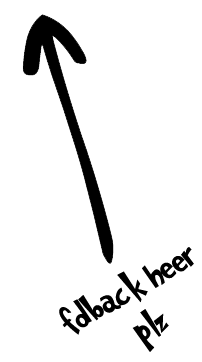 After placing a card on the table, another card will automatically be drawn from the draw pile and placed on the playing field on the table. The aim of the game is to capture cards by matching 2 or 4 cards from the same Neopian world together. You can use the card drawn from the draw pile on your turn to capture as well, but you have no way of knowing what it will be. Once you capture pairs or quads, the cards will appear under the playing field in the capture area. Hover over a captured card with your mouse to see it larger. Your opponent will also play and capture cards in a similar way. Godori's deck contains 48 different cards, representing 12 different worlds of Neopets. You can see the complete deck by clicking here . 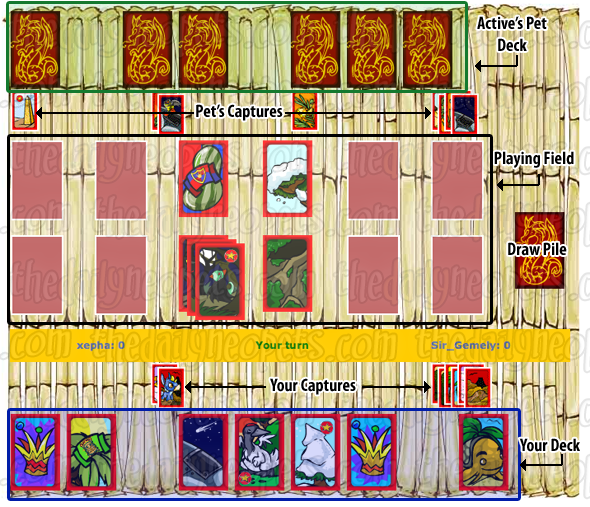 However, in order to score points, you need to capture cards within specific categories : Neopets, Petpets, Altador Cup, or Altador World. Once you achieve a certain minimum number of cards in a category, you will earn points for that set and for any additional cards. You can also earn bonus points if you capture specific combinations of cards within a category, such as Flying Petpets or Altador Cup banners of the same shape. The game ends when either you or your pet have scored at least 50 points. If you win, you will get a base reward of 200 NP, plus 5 times the difference in points between your score and the score of your pet. For example, if you win 50 points to 42 points, you earn 200 + 5 * (50-42) = 240 NP. On the other hand, if you lose, you will have to pay 200 NP plus 5 times the difference between your score and the score of your pet. Try to capture as many cards as possible. Capturing more cards maximizes your chances of meeting the minimum number required to earn points as well as increases your chance of getting combinations. At the same time, it reduces your opponent's opportunity to earn points! Focus on cards that gives a higher reward. The cards from Neopets group (which have a yellow star on them), the flying Petpets, or any set of similarly-shaped Altador Cup banners give more points and can help you gain an edge over your opponent. If there are already 3 cards from one world on the table and you have the last card of that world in your deck, hold onto it until you don't have any better moves. You are guaranteed to capture those cards so there's no need to rush. If you can't match any cards on the playing field, look at what was already captured by you and your opponent to get an idea of the remaining cards in the draw pile. With a bit of luck, you will draw a card to match your move. The Lost Desert card with the sun and the Haunted Woods card with the trees with faces each count as 2 cards. It's a good idea to try to capture them since they count double. Also, the Turdle card from Mystery Island counts either as a Petpet or a Neopian World card. If you capture this card, you have twice as much chance to be awarded points for it. Try to maximize the number of piles on the playing field. If you have 8 different worlds on the table, it's more likely that the card drawn from the draw pile will match one in the playing field and you will capture that pile. However, this strategy is somewhat risky - your opponent can benefit too! Remember that if you just click on any random card without thinking, you will most likely lose the game. It's not a great game to play for Neopoints, either, and it doesn't give out any trophies. Most people just play for fun. It takes some time to get used of Godori, but once you become a master and remember which matches give out more points, you can really enjoy the game!